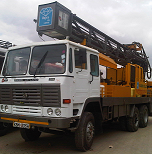 VAJRA DRILL LTD launched its services in Kenya with an objective to offer quality services in the field of ground water exploration of and Civil Works. The company is promoted by a group of technocrats from India and Kenya. DTH 2000 – very heavy duty, with capacity to drill up to 400 meter, fitted with ELGI compressor 1100/300 PSI air pressure - 2 Nos.